Everyone appreciates receiving a present of a gift card, cash, or check, but given in an envelope, it’s not very imaginative. 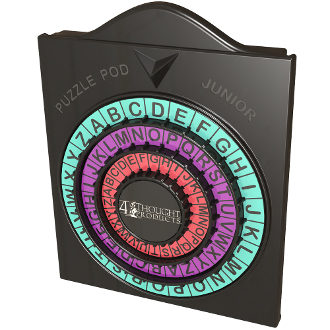 Puzzle Pod Junior - secret code puzzle box, transforms the exchange into a fun, interactive, code cracking game between you and the recipient. If you’ve had fun with our Puzzle Pod Cryptex – Brain Teaser and Coin Bank, then you’re going to love this new gift puzzle as well. For this gift card holder, you first choose your own personalized three letter code word and think up a series of related clues. Setting up the unlocking code on the gift puzzle box is really simple. All that’s required is to peel off the three adhesive backed alphabet ring labels and apply them to the dials, aligning your chosen code letters with the notches on the dials. The drawer on this money puzzle can only be opened when the code word is aligned beneath the marker on the cover. You can make the game of cracking your code easy or more challenging by the frequency and type of clues you deliver either in person, phone, texts, or emails. The game can last an hour, a month, or longer. Send a unique birthday or holiday gift to someone ahead of time - taunt them with harder, more obscure clues at first, followed by progressively easier ones as the special day arrives. Set up of your brain teaser game is completely open to your imagination - fun for both you and the recipient.